Another one of my popular calligraphy styles for Envelope Addressing for Wedding Invitations or Party/Event Invitations is the “Lily Wang” font style. This is a script printing style that would be fitting for any formal occasion. The ink in this example is black and the envelopes are white. You could pick another font style or envelope color depending on your event theme and colors. If you have dark envelopes for example, blue/navy blue, black, brown or red for holiday cards, you might consider White Ink Calligraphy. 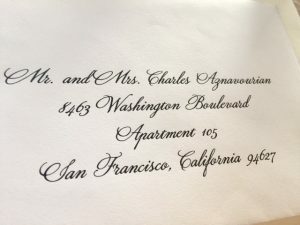 The above calligraphy sample, “Lily Wang” font style calligraphy is printed on a white envelope using Hyegraph Calligraphy. However, the same font style can be printed for Wedding/Party Invitations, wedding/party place cards, wedding/event menus, programs or other printed materials as Wedding Thank You Notes. 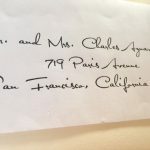 The example above of a Wedding/Event Calligraphy for Envelope Addressing is printed as “San Francisco, California” however, when you provide me with your guest list, I will address your invitation envelopes with San Francisco, Napa, Los Angeles, Miami, FL, Boston, Texas, Seattle, Hawaii and or England depending on where your guests reside in the country. Make sure your addresses are correct and take one example of your complete invitation set to the post office for weighing prior to mailing your invitations. 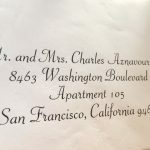 In addition to Envelope Addressing you can see our example of Place Card Calligraphy, Menu Calligraphy, Wedding Programs and Custom Calligraphy on our Blog. You can pick black ink for $1.00, colored ink for $1.25 or white ink calligraphy for $1.50.